During the vast majority of this segment, Mr. Dimon's central forehead was contracted. When this nonverbal is seen with a frown (even a subtle one) or neutral mouth, it's a highly specific tell for emotional or physical pain. Mr. Dimon is emotionally distraught over this issue. He can be experiencing such emotional pain because JPMorgan Chase committed the mistakes - or because he's being scrutinized in such a public manner - or both. Jamie Dimon should not keep his fingers interlaced in front of him as many do during such interviews. Most people without any nonverbal training will interpret this as a patronizing - certainly a negative message. However, this common hand configuration actually represents anxiety and a closed-off, defensive mindset. Dimon is also seated with his back very straight, perpendicular to the floor. It would better serve him to lean slightly forward. This positioning lends itself to a more engaged and open emotional tone - while simultaneously allowing for a more naturally opened hand-arm positioning. Mr. Dimon would also be well advised to avoid the pinch-point (down) gesture as well as index finger (forefinger) conventional pointing. Tension in the hands tends to increased mid-facial tension and pointing is universally negatively received. These are also some of many palm-down gestures which should not be used in scenarios where one is trying to explain errors and/or build trust-rapport. Palm down gestures and most varieties of pointing are overly-alpha, and in this (and most) contexts, they will come across as patronizing, condescending and inflammatory. The "Conventional Steeple" which Dimon uses during 1:19 - 1:23 segment is another gesture which is a rapport destroyer. While this variety of steeple does send signals of confidence and authority - it is nearly always over-used (usually anything more than a second or two is too much) and backfires. It must be used at very specific times if at all - almost choreographed. Most people are better off never attempting it. Mr. Dimon displays a variation of a "Duping Delight" at the 1:21 mark where he displays a subtle partial smile when he said, "...in fact, the portfolio just had an unrealized gain of more than $8 billion ..." Within the context of trying to admit his company's wrong doing and sloppy work, he also expressed this very positive financial windfall - and like anyone would be, he's proud of himself. An interesting and somewhat subtle display of anxiety is seen expressed at the 0:35 second mark and again at 1:08 when Dimon sniffs. Another more obvious and related anxiety tell is seen at the 0:31 mark when he takes a heavy swallow. 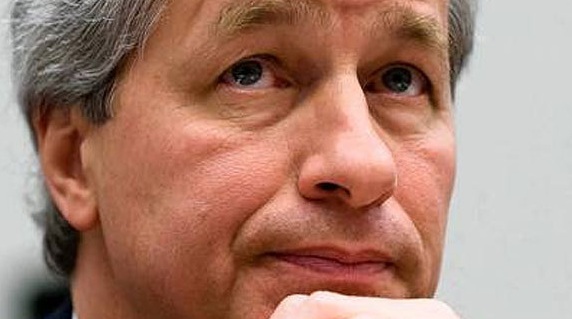 From a nonverbal analysis view, Jamie Dimon has significant emotion pain and anxiety. In the midst of crisis management, he gets better grades than most. However, there is still room for significant body language improvement - which would translate into increased public (and governmental) empathy for both him and JPMorgan Chase. Mr. Dimon - before you testify before Congress, call me.